So, as it turns out, all you need to survive Mars is potatoes and duct tape. 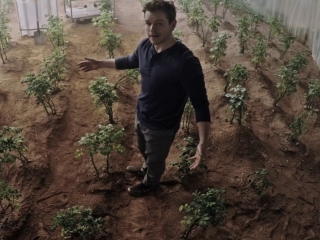 This is the first of many things that came out of The Martian. Perhaps more important than that survival tip though, is that this is, well and truly, a great film. On all fronts, Ridley Scott has brought together a project that shines. Despite initial concerns that the film would be somewhat rehashing Matt Damon’s role as Mann in Christopher Nolan’s Interstellar, The Martian stands, titan like, on its own. This is no doubt due to the fact that it’s actually an adaptation, based on the eponymous novel by Andy Weir and adapted for the big screen by the excellent Drew Goddard (of Cabin in the Woods and Daredevil fame). What we’re dealing with here is a far cry from the futurist, near operatic drama of Interstellar, instead we are watching the story of one man’s battle for survival in one of the most inhospitable environments known to man. What really separates these two films however, is just one, very important thing. Matt Damon, in the role of Mark Watney, is viciously funny. Seriously, any concerns you had about similarity, throw them right the hell out of the window. The Martian is tense and dramatic sure. We are, after all, dealing with a guy, trying to survive, alone, with limited supplies, on freaking Mars. And all of that is ridiculously exciting, particularly given NASA’s recent announcement of their discovery of water on the Red Planet. 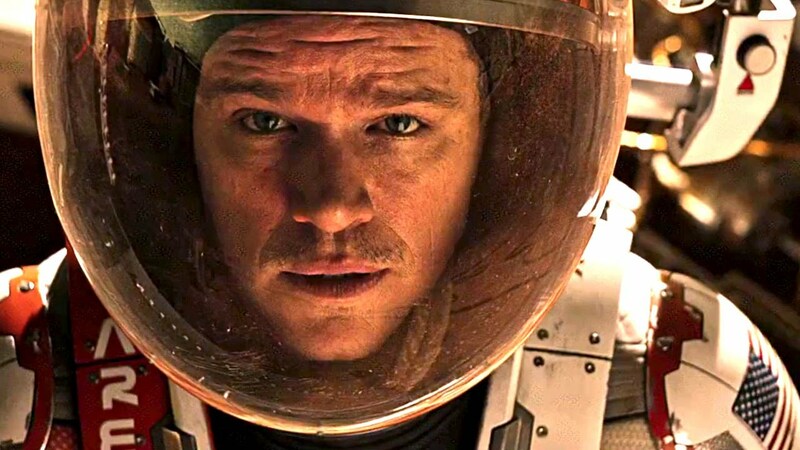 But, at it’s core, The Martian is as much a dark comedy as it is a survival story.So, yeah, in case you didn’t already know, Matt Damon has comedy chops. Said chops are helped in no small part by the whip-smart script which found the perfect way to transform the book’s large monologues into something screen-workable, by having Watney make video logs of his experience. It’s simple, but elegant. Before I get too caught up in Damon’s performance though, I should give due mention to the rest of the cast. Although this is very much the story of Mark Watney, and Damon’s role is obviously foremost, the rest of the cast don’t exactly slouch. It’s probably helped by the fact that there is an improbably amount of famous showing up here. Everybody from Jessica Chastain to Jeff Daniels is in The Martian and all of them deliver sterling performances. Well, almost everybody. Sean Bean shows up here in a role that feels just a little out of place. In fact, I think he may have been cast solely for a Lord of the Rings joke that happens late in the film. Aside from the slightly stilted performance of Bean however, it’s fair to say that the entire cast is on top form, even if their characters aren’t exactly the most fleshed out as compared to the leading man. Also, all props to Ridley Scott. I mean, not everything he does is always perfect (Prometheus being the most notable in terms of comparison) but boy oh boy, that man knows how to make a film. More than that, he knows how to make a spectacle. 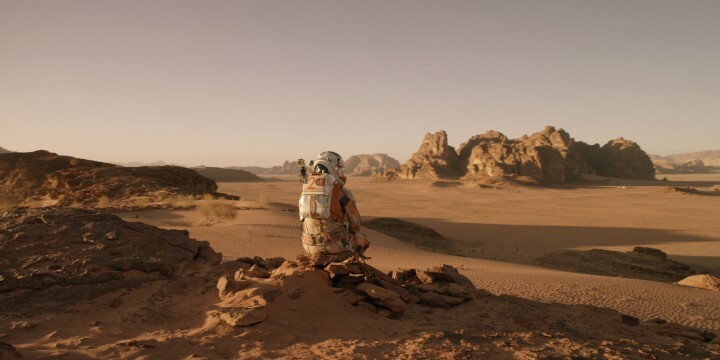 I don’t know exactly where The Martian was filmed but it looks amazing. I imagine there was more than a touch of CGI involved in that look but when something comes out that pretty, I’m not going to make too many complaints. Aside from the look of the thing, Scott also appears to have wrung the very best out of his team, with almost every moment of the film delivering exactly what you want it to. There were more than a few tense moments of hand wringing from me, I’ll tell you that. That said, there are also a couple of dud moments. A bare handful, I must say, and incredibly minor at that. It’s just a bit of a shame when you get caught in a scene, even if it’s only for a minute, that feels like it’s kind of forcing you to feel a certain something rather than bringing it naturally. Finally then, just in case it wasn’t abundantly clear how much I loved this film, I want to make it very clear that you should already be on your way to the cinema to see this film. Whether it’s for the science (which is rather wonderfully at the fore), the comedy (Captain Blondebeard, never forget), the high-stakes drama (seriously guys, the end. No spoilers but goddamn that got tense) or just the beauty of seeing a film that so amazing encapsulates so much of how we think and feel about space and Mars while presenting all of that emotion in a brilliantly human way, The Martian is a film that is well worth your time and your praise. Other filmmakers would do well to pay attention and learn from a film that manages to be so superbly, almost painfully human, while set in a narrative that is determined to explore the triumph over the alien. Because, really, that’s where The Martian fits in the canon of film. It is a story, in the vein of, I guess, films like Castaway, where the ultimate message is the triumph of man’s will over overwhelming odds. There’s something rather nice about that, don’t you think?